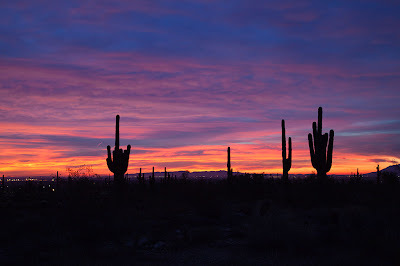 I just returned from a 3 day trip to Phoenix and was blessed by a gorgeous sunset the first night and beautiful clear skies the next two nights. 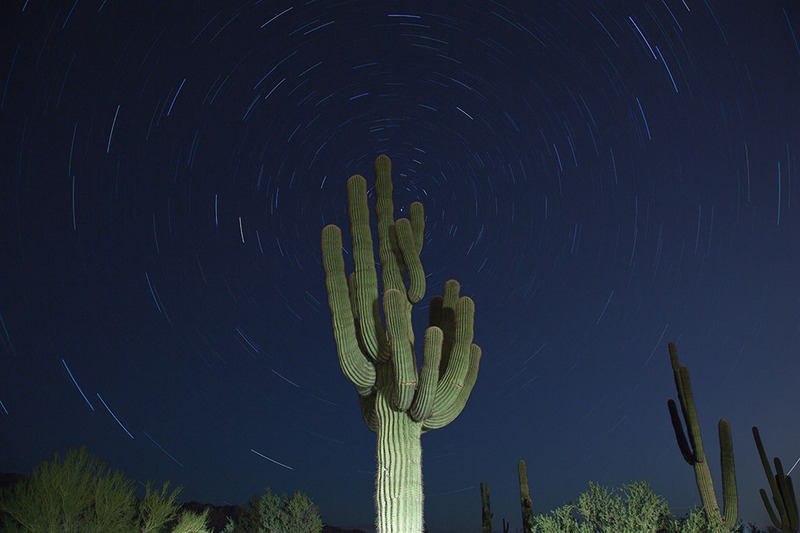 Pictures of long exposure light trails, with the stars swirling around the North Star, have always been favorites of mine. I have tried, unsuccessfully, several times over the past couple years. I finally succeeded early one morning a couple weeks ago with a star trail over the Potomac River. However, I couldn't get a long enough exposure before the sun rose. More importantly, I lacked an interesting foreground. 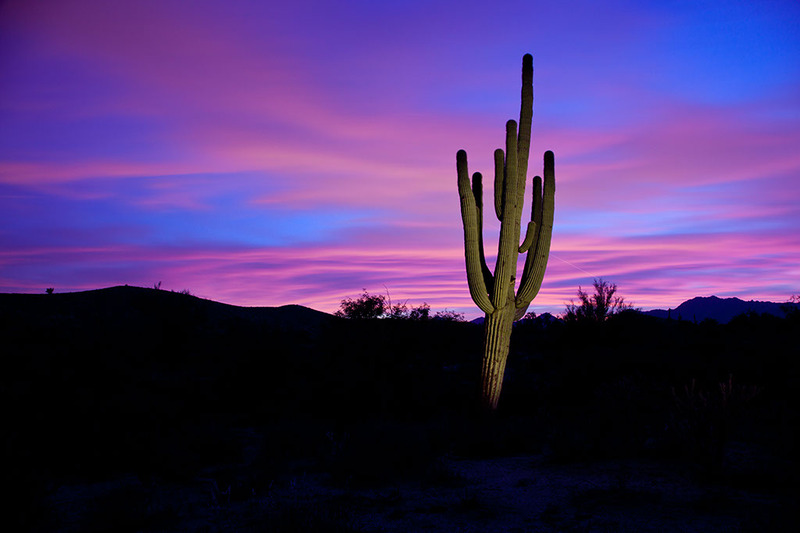 The Saguaro Cactus and desert night sky of Arizona could solve both of those issues. 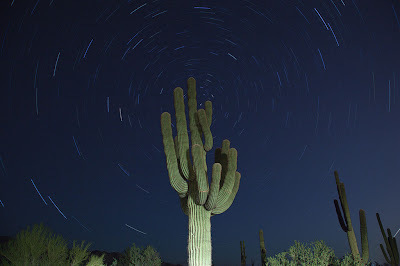 I arrived in Phoenix to cloudy skies -- not promising conditions for star trails. I went to McDowell Mountain Regional Park anyway, if nothing else just to scout out the area. I arrived just after sunset. 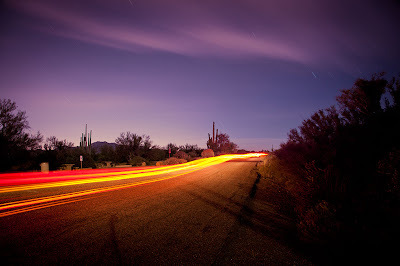 While there I played around with some long exposures, light painting saguaro cacti and finally capturing a 6 minute exposure of the night sky as I drove the car back and forth along the road -- with only the parking lights, no headlights. 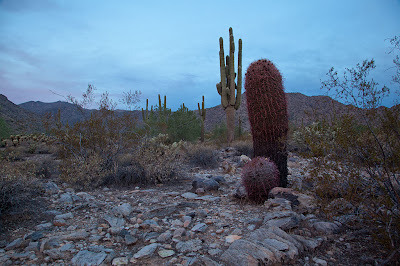 The next morning, I went to White Tank Mountain Regional Park -- which was about an hour closer to my hotel than McDowell Mountain. The clouds were still around and I was greeted with a beautiful sunrise. 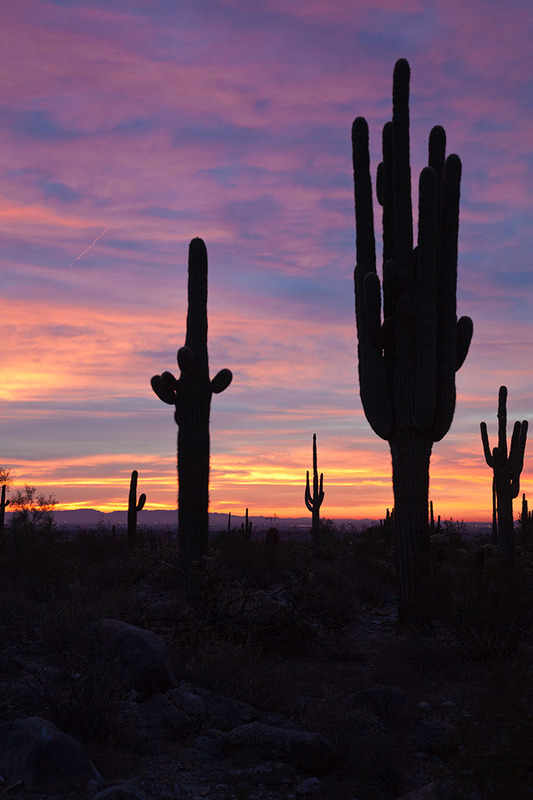 The skies cleared beautifully during the day on Monday, but I didn't get out of my work meetings in time to venture to McDowell Mountain that evening. 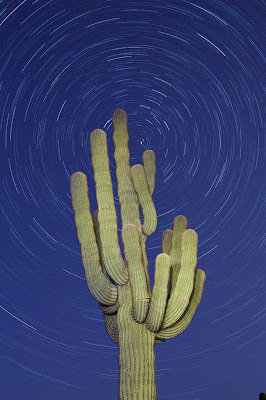 Opting for the closer White Tank Mountain to attempt a star trails image, I set up my camera and started clicking away. I intended to use my flash light to paint some light onto the saguaro towards the end of the exposure -- about 40 minutes. I never had to do that as the park ranger pulled up just before 8 pm to kick me out of the park -- the lights of her vehicle lit the cactus up almost perfectly. I returned the following evening to the same location for a 2nd try. This time I used my 50mm F/1.4 lens instead of a 24-105 zoom and chose a portrait orientation rather than a landscape. I calculated how long I would have before the ranger showed up and set my timer for a one-hour exposure. I also gave myself enough time to paint the cactus with my flashlight during the last couple minutes of the shot -- finishing just as the ranger pulled into the parking lot. As always, I welcome your comments and feedback on my images. Please use the comment section below to leave comments.